My roommate is originally from Belarus, and through her I have been able to enjoy some unique dishes from her motherland. While I like to tease that all they consume there is vodka and potatoes, Russian cuisine can be quite varied. 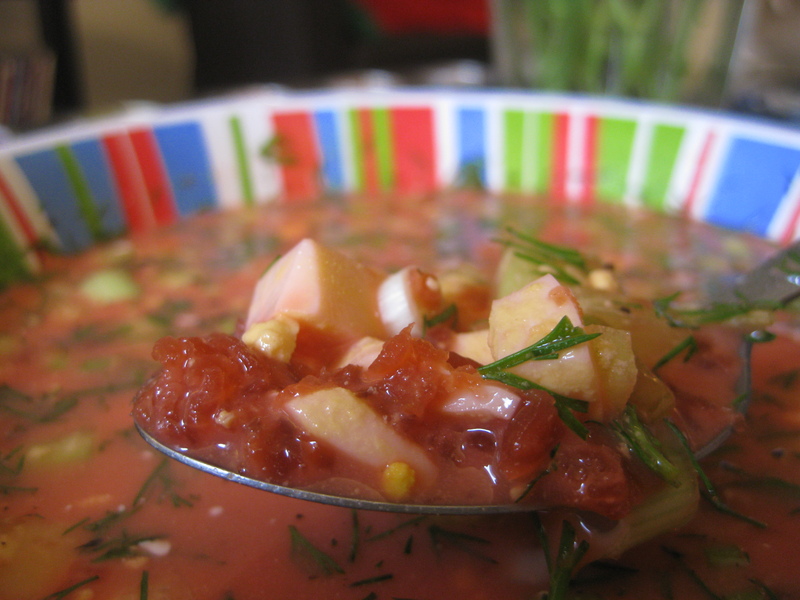 One of my favorites is Holodnik (literally “cold soup” in Russian), which Natalya makes with beets, cucumbers, egg, dill, green onions, and sour cream. 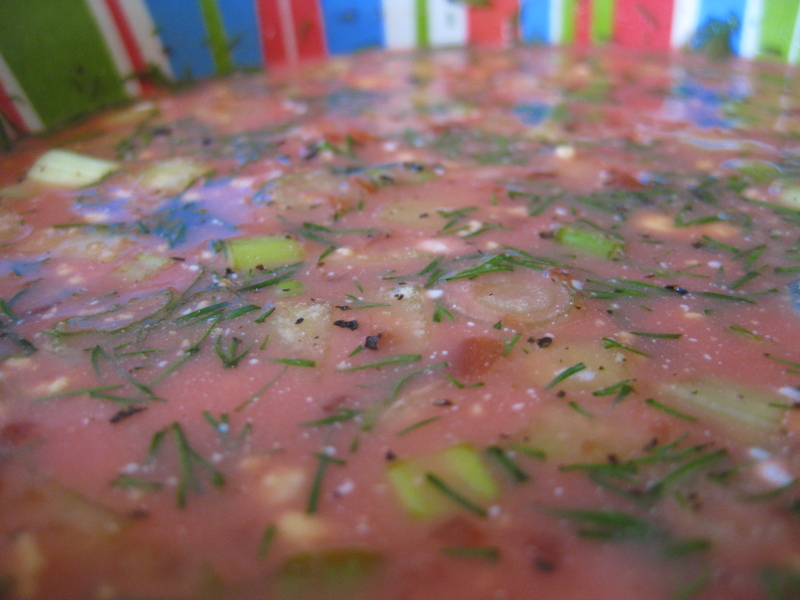 This chilled soup is light and flavorful and shockingly pink – perfect for a hot summer’s day! We take the easy route in preparation by buying a store bought jar of Borscht, usually you can find it in the ethnic food aisle near the kosher stuff. Not to confuse you further with the definition of “borscht” but that is what the jar says – all it is though is boiled and then shredded beets in water. However, you can easily make your own by boiling whole beets in water until they become soft. Cool the beet water and filter it using a sieve. Peel the beet and shred it. Combine the shredded beets back with the chilled beet water and store in the fridge until ready to use. Try serving this soup with Salat (Russian Salad), which is super easy to make at the same time as both use most of the same ingredients. 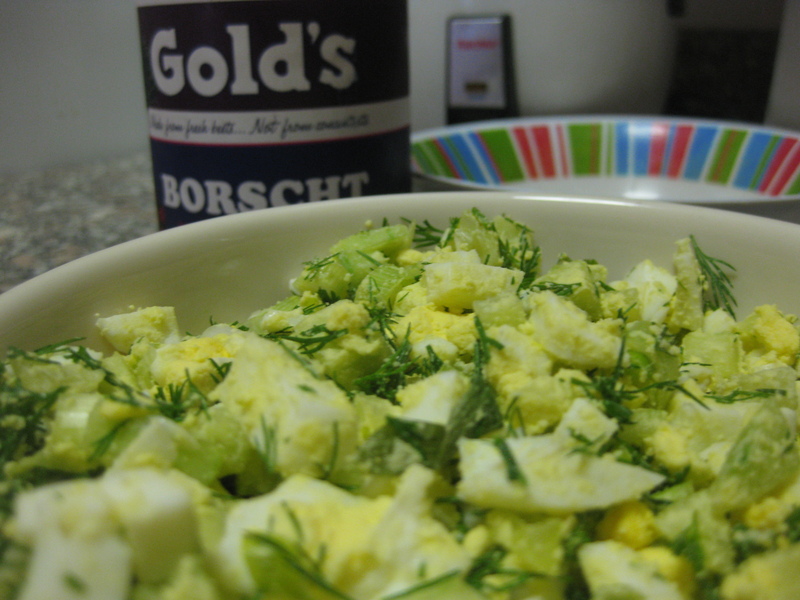 Dice the hard-boiled eggs, cucumber, green onions, dill into small cubes and mix together in a small bowl. Take the serving soup bowls and put 1 tbsp of sour cream at the bottom of each bowl. Spoon some of the chopped mixture into each bowl, enough to cover the bottom. Pour 1.5 C (12 fl oz = half the jar) of borscht into the bowl and stir until the sour cream is mixed thoroughly. Add 1 tsp of white vinegar to each bowl (only if you use the store jar of borscht which tends to be very sweet) and ground black pepper to taste. Looks great, as do all the other posts I looked at. I was playing a gig in Moscow recently and had some lovely Borscht. From what I could gather, they use a very strong concentrated beef (or mixed meat) stock to get the amazing taste that underlies all the sweetness.